You have made it to the University of Wisconsin – Madison, that’s no small feat, so be proud of yourself. If you’re anything like me, however, you’ll find that the transition from life at home and high school academics to the college scene can be overwhelming. My grades that first semester were reflective of my feelings, tired and defeated. So what did I do? I made lists and new routines to help organize my personal life, but most importantly, I found ways to improve my study techniques. I worked hard throughout high school, and my grades reflected that. In to college, I began my studies using the same techniques. Hand written notes, flash cards, online study sites, group sessions, and my favorite, using white boards to teach myself the content again, out loud. It wasn’t enough. Well, in hindsight it was enough, I just wasn’t optimizing the time I put into studying. It might sound counterintuitive, but in fact, a productive break can make all the difference. I find that when I participate in physical activity, my concentration gets better, and my energy increases. I decided to apply this idea to my studies. One time in each hour of studying I stopped to take a two minute break. In those two minutes, instead of sitting on my phone, I did jumping jacks, pushups, crunches, anything to get my blood flowing and reinforce my concentration. It is a tip I wasn’t told coming into my undergraduate career, though I wish I had. I continued the practice through the rest of my undergraduate career and now, into my graduate career. Not sure where to start? 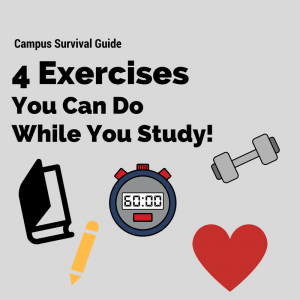 Check out this article for 4 Quick Study Break Exercises!